Anthony LaPaglia, star of the CBS television series, Without A Trace, is being featured in American Express’ Australian advertising campaign, My Life, My Card. LaPaglia, co-owner of Sydney Football Club, is the first Australian to be featured in the series. The campaign included a competition for an honorary signing with the Sydney Football Club. LaPaglia reveals that his childhood ambition was to play football in Serie A (Italy). His wildest dream was to own a professional football team. His biggest challenge has been being part-owner of a professional team. Anthony’s fondest memory was finding out that his wife was pregnant. His proudest moment was witnessing his daughter’s birth. His alarm clock is his daughter – 6 am sharp. Never misses. LaPaglia’s first job was selling shoes. His indulgences are watches, sneakers and Jimmy Fraser, Sydney Football Club’s Keeper Coach. His last purchase was a Rolex: Paul Newman Daytona. His soundtrack is Elvis Costello’s North. His favourite movies are “Best Years of Our Lives”, and “Meet John Doe”. He retreats into good books, and the peace and quiet after midnight. LaPaglia’s perfect day is breakfast with his wife and daughter. Game of football in the afternoon with friends. His inspiration as a footballer is Gordon Banks. As a man his inspiration is his family. LaPaglia’s life would be nothing without Gia and Bridget. His card is American Express. 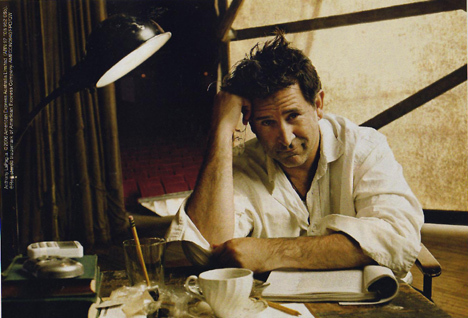 See Anthony LaPaglia Online, and Anthony LaPaglia at IMDB.